Das wichtigste an einer Öffentlichkeitskampagne ist die Öffentlichkeit und die erreicht man wirklich nur mit Hilfe der Medien. Wenn die Medien nicht mitspielen, dann sind Kampagnen wie diese wertlos. Insgesamt war das Interesse der Medien sehr gut. Obwohl dieses Projekt keine nationalen Medien an Land zog, so waren endlos viele regionale Zeitungen und Radiosender dabei. Ein Netz von Regionalmedien ersetzen locker die nationalen Medien. Ich möchte mich ganz herzlich bei allen Medienanstalten für ihre Unterstützung bedanken. Auf dieser Seite veröffentliche ich einige veröffentlichten Zeitungsartikel und nenne die meisten der Radiosender die mich auf großartige Weise unterstützt haben. Ich weiß das es noch weit mehrere Mitglieder der Medien gibt die mich unterstützt haben, hier nenne ich die, die mir zugeschickt wurden. 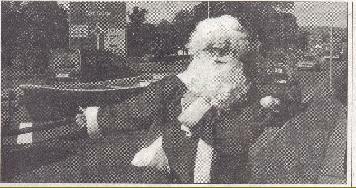 Santa Claus hitching around Ireland is not a sight many motorists expect to encounter as they go to work and school… especially in the middle of the summer! But that’s exactly what happened in Carlow recently. 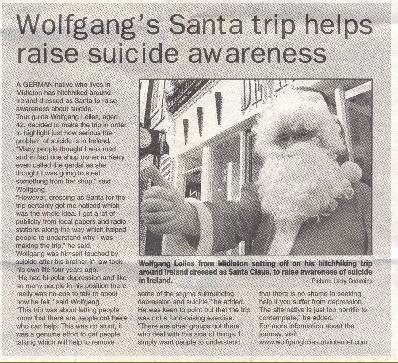 Wolfgang Lolies was the Santa in question and he was hitch hiking around Ireland in a bid to raise awareness for depression and suicide. From Middleton in Co. Cork, Wolfgang was inspired in his venture by the tragic death of his brother in law who committed suicide some time ago. Wolfgang said that Middleton has the highest suicide rate in Ireland and the second highest in the world. He set off from Middleton with the goal of travelling 1,000 in seven days. His visit to Carlow marked his ninth day but he was still upbeat. Wolfgang – a tour guide by profession – said that last year 444 people took their own lives and 293 people died on our roads. 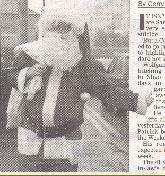 Wolfgang, who has two children, said that he decided to dress as Santa both to draw attention to himself and because Christmas is a time when people feel most vulnerable. Although enthusiastic, he is realistic about his efforts. ‘I know I am not going to change anything but I am hoping to inspire people.Wolfgang had spent eight months planning his route. Although slower than Saint Nick, Wolfgang is right up there with him when it comes to getting to every corner of the country.